At the forthcoming Tip-ex & Tank-ex 2018 Show at the Harrogate International Centre, Yorkshire, DAF Trucks is showing its latest LF and CF-series models. Both model ranges will be exhibited with ‘Construction’ specifications designed for the rigours of on-/off-road applications. A DAF LF 260 FA 18-tonner, and a CF 450 FAD eight-wheeler fitted with steel muckaway Thompson tipper body will be showcased. The latest CF Construction (N3G variant) model from DAF Trucks offers a significant 250kg payload benefit over its CF predecessor. This weight saving is achieved predominantly with an SR1132T single-reduction tandem-axle fitted with disc brakes, a redesigned exhaust after-treatment system, aluminium air-tanks and a redesigned steering system. Designed predominantly for off-road, muck-away work, the New CF Construction model is equipped with straight beam front axles to provide high ground clearance and approach angle. The 5.7m wheel-base show exhibit features a Day Cab, a PACCAR MX-11 engine with standard MX engine brake and standard 12-speed, automated TraXon gearbox with on / off road software. Mounted on its chassis, Thompsons has fitted its Loadmaster Lite body complete with Auto-Loc ‘R’ Tailgate, two-tier cab shield, electric blue mesh sheeting system, PM Onboard 4 Point 1155 weighing system, side and rear under run protection and Binotto TFC 145 front-end tipping gear. Chassis and bodywork result in an impressive 12,560kg unladen weight. 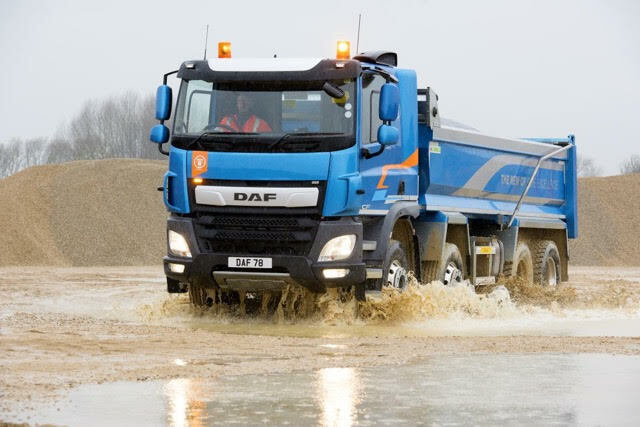 DAF Trucks’ LF 260 FA ‘Construction’ chassis is an 18-tonne GVW utility vehicle featuring an Econ permanently mounted, five cubic metre, twin-chamber hotbox which is designed for road patching work. The 4.15m wheelbase Day Cab chassis is powered by a PACCAR PX-7 260bhp engine coupled with a six-speed manual gearbox. Although not normally used in the construction sector the XF Super Space Cab low-deck tractor unit – used to pull the DAF Showtrekker trailer – will no doubt be a popular attraction. The truck features a specially commissioned artwork by air-brush artist Adam Haden, depicting DAF vehicles throughout the company’s 90-year history.